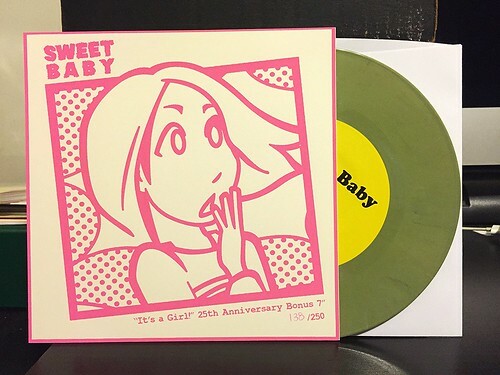 When I reviewed the reissue of It's A Girl last week, I held off on writing about this bonus 7" that came along with it. While it is a nice little addition to the package, it doesn't really feel like part of the album to me. I thought it should be dealt with on its own. On this 7" we have two previously unreleased songs and two live recordings. On side A you've got the two studio tracks. "Pretty Baby" is decent enough, but the recording makes it seem kind of flat. It's not bad or anything, but it doesn't really stand out from the pack and I can see how it didn't make the cut to end up on the album. "Loving Every Girl In The World" starts off with some good energy built off of a pretty fun bass line, but the song as a whole is kind of average. In particular the lyrics are awfully one dimensional. There's this odd breakdown towards the end that brings the song to a screeching halt. Again, I can see why it wasn't on the full length. The B side is where the two live tracks live. I thought I read somewhere that these were taken from a recording of the band's first show, but I can't find that info again anywhere now. I'm not totally sure, so forgive me if that's wrong information. What I can tell you is that it sounds like something recorded at a band's first show. "I Can't Sleep" is just guitar and vocals (and I guess a little tambourine or some other kind of shaker thing). You can't really hear the vocals and the recording as a whole isn't very good. One of my favorite songs on It's A Girl is "Gotta Get A Girl." The live version here can't hold a candle to the one on the record. Again, the recording is so bad you can't hear much of anything really. This side of the 7" is an interesting document and certainly a fun little bonus to go along with the reissued record. You'll never hear me argue for less bonus content, but I think this 7" would have seemed stronger with just the two unreleased tracks. The live stuff doesn't add much. I think it's great that Eccentric Pop went all out and even bothered to make this 7" with the extra material. I'm sure they would have sold just as many copies of a straight reissue of It's A Girl. That being said, these songs are more curiosities than anything else. They're fun to listen to once or twice, but I just can't really see it being something that I'll play very often.